Even before he had become an established player, Granit Xhaka was called better than Xherdan Shaqiri by former Basel coach, Thorsten Fink. It was a big claim as Shaqiri was considered as the finest talent to have emerged from Switzerland in decades. However, Xhaka has shown flashes of immense talent since having made his debut for Basel. His ability to strike cleanly from the distance has made him a fan favorite at all the clubs he had played for. His passing range is also great but his indiscipline and inconsistency have stopped him from becoming the player that everyone who is close to him had hoped for. Granit Xhaka started his soccer journey at the youth setup of Concordia Basel. Later, he joined the youth academy of Basel. Granit Xhaka is represented by his father, Ragip Xhaka. 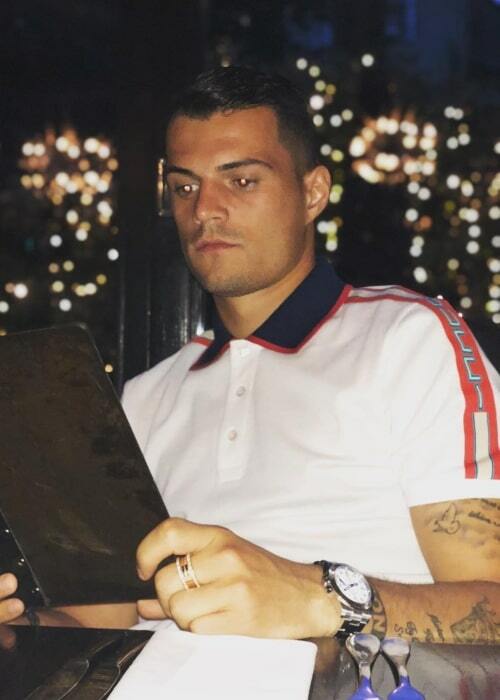 Leonita Xhaka (2017-Present) – In July 2017, Xhaka got married to his girlfriend Leonita Lekaj, who also has a Kosovo Albanian ancestry, in a lavish and romantic wedding ceremony. They had first met while he was playing for Borussia Monchengladbach. Granit Xhaka has inked a personal endorsement deal with Under Armour. He wears the brand’s footwear for his professional matches. Being the main component of the Swiss National team. He has played for the national team in the FIFA World Cup 2014, FIFA World Cup 2018, and UEFA Euro 2016. Having delivered strong performances for the German side, Borussia Mönchengladbach. During his stint with the club, he made around 140 appearances. In July 2010, he made his professional debut with Basel in the 3rd qualifying round of the 2010–11 UEFA Champions League match against Debrecen. He scored his side’s final goal in their 2-0 win. In August 2012, Xhaka made his debut for Borussia Mönchengladbach in a match against Alemannia Aachen in the DFB-Pokal first round. In August 2016, he made his first appearance for Arsenal in the Premier League match against Liverpool at Anfield Stadium. He replaced Mohamed Elneny in the 65th minute in his side’s 4-3 win. In June 2011, he made his first international appearance in a UEFA Euro 2012 qualification match against England at Wembley Stadium. In 2013, Granit Xhaka made his first TV show appearance on the sports documentary series, Das Aktuelle Sportstudio. At the end of his debut season with Basel FC, he managed to win the Super League Championship title. He played 19 matches in the league campaign. In his 2nd season with Basel, he played 23 matches in the league. He also managed to win a Domestic double with his club winning the League Championship title and the Swiss Cup. In May 2012, the Swiss club announced that they had reached a transfer deal with Borussia Mönchengladbach. The transfer deal was reported to be worth €8.5 million. In September 2012, he scored his first goal for Borussia Mönchengladbach in a 2-3 home loss against 1. FC Nürnberg. It was his only goal of the season. Arsenal announced in May 2016 that they had reached an agreement to sign Xhaka from Borussia Mönchengladbach. The transfer fee was reported to be in the region of £30–35 million. He scored his first goal for the English side in September 2016 as he scored a 25-yard screamer in a match against Hull City. His side emerged as a winner with a 4-1 scoreline. Just 4 days after having scored his debut goal, he scored another stunning long-range goal. This time he scored from a distance of 30 yards in an EFL cup match against Nottingham Forest, which ended in a 4-0 win. In his debut season with Arsenal, he managed to win an FA Cup. He even starred in the final against Chelsea, which his side won by 2-1. Before he decided on his international allegiance, he was torn between representing his birth country, Switzerland and his ancestral country, Albania. He eventually went for the former as they had shown more interest in him while the Albanian federation was ignoring him. He scored his first international goal in a match against Luxembourg, which was his 6th international match. It was the only goal scored in the match. During the UEFA Euro 16, he became a part of the history as he lined up against his brother, Taulant Xhaka, in Switzerland’s match against Albania. His mother was in attendance at the match and decided to wear a T-shirt that featured the flags of both the countries. He courted controversy during Switzerland’s match against Serbia in the group stage of FIFA World Cup 2018. He and Xherdan Shaqiri decided to celebrate their goals by making an eagle gesture, which was a nod to the double-headed eagle on the Albanian flag. He was slapped with a fine of 10,000 Swiss francs by FIFA for making a political gesture during a match. Albania and Serbia have been embroiled in long dispute and Xhaka’s gesture was seen as an insult to the Serbian public. 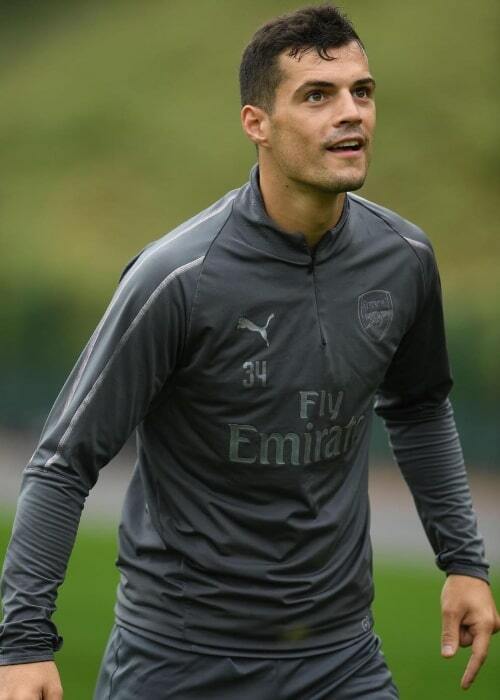 Follow Granit Xhaka on Facebook and Instagram.